You would like to have access to filtered reverse osmosis water in your house. You would like to install a filtration system, but at the same time you want to save money and therefore not buy an expensive all-in-one solution. So you are thinking about making your own reverse osmosis water filter at home. Let’s stop here for a moment. The problem with doing this from scratch is that you need pre-treatment filters, a pump to increase water pressure (if psi in your house is too low), a reverse osmosis membrane, a filter housing, piping, adapters, valves and more. Reverse osmosis membranes cost between $60 to $100 depending on their capacity. In regards to pre-filters, there are a few options to choose from. Granulated Activated Charcoal (GAC) is the most common type of filter. It removes unwanted particles such as lead and other contaminants. Solid or powdered carbon blocks are the other type of basic filters that remove water contaminants usually to a higher degree as well as chlorine and fluoride. Carbon filters cost about $25. Adding the costs for housings, valves and water lines, it’s unlikely that you do any better than the mass-marketed filtration units in terms of money that you would have to invest. In addition to that, finding a semipermeable ro membrane suited to your needs, that fits in a housing that is working under pressure and does not cause any water leakages is pretty difficult. Well, that doesn’t look very promising. So what are the available alternatives? Attach the t-valve to the cold water line of your kitchen sink. By using a t-valve you will still be able to turn on the cold water at your sink. Tee off the ¼″ water line to your filter system. Add the quick connect between the system and the valve to allow water to be shut off, when system is not in use. Once the water went through the whole system, you have 2 outputs. Let the wastewater flow into your kitchen sink. Collect the filtered water in a tank, if you want to store it. Make sure that the tank is BPA-free and food-safe. The following video is a great demonstration of how to do the setup. To save money it’s always a great idea to make things yourself instead of buying them. Unfortunately, it’s not easy to build a well-functioning reverse osmosis water filter system that is not leaking any water and comes cheaper than a commercial ro unit that can be bought in stores or online. What’s more is the extra time and effort you have to invest have not even been taken into account yet. We recommend you to read some of our reverse osmosis reviews. Maybe you can find a filter unit that suits your needs and fits your budget. We also created a list of the best countertop ro systems here, that usually are a lot cheaper and don’t need to be installed, which is a time saver. 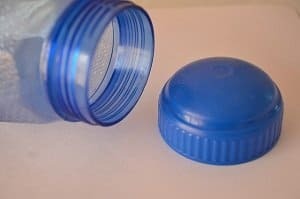 Cut off the bottom of the water bottle. Create a hole in the lid large enough to fit in the plastic straw halfway. Place the bottle with the straw onto the jar upside down. Place the cotton batting at the bottom of bottle as the lining for your water filter. Place a first layer of activated charcoal granules on top of the cotton batting followed by a layer of fine grain sand. Next comes a layer of large grain sand, then a layer of fine grain gravel followed by a layer of large grain gravel. Alternate the layers until the bottle is filled up. 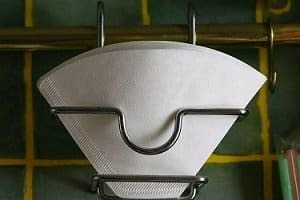 Place the coffee filter on top. In order to clean your water, pour it through the coffee filter. Contaminants will be absorbed as it moves down the bottle to the straw. The filtered water will than trickle through the straw and into the jar. Obviously, you can’t process a great amount of water using this filter and every once in a while, you need to replace the cotton batting, charcoal granules, gravel and sand. Still, it’s a cheap and easy way to get access to filtered drinking water, if your budget does not allow for a more pricy reverse osmosis system.